PH1020951/136 Variation Accepted: Operating between Ilfracombe or Barnstaple and Appledore or Westward Ho! given service number 21/21A effective from 24-Sep-2012. To amend Route and Timetable. PH0006741/98 Variation Accepted: Operating between Bude, Strand and Holsworthy, Church given service number 599 effective from 19-Sep-2012. To amend Timetable. PH0006741/99 Variation Accepted: Operating between Holsworthy, Church/Library and Okehampton, West Street given service number 599 effective from 19-Sep-2012. To amend Timetable. PH1020951/172 Variation Accepted: Operating between Barnstaple Bus Station and Barnstaple Park & Ride given service number 19 effective from 24-Sep-2012. To amend Route and Timetable. PH0004983/122 Cancellation Accepted: Operating between APPLEDORE Seagate Hotel and ILFRACOMBE Bus Station given service number 1/1A/2 effective from 23-Sep-2012. PH0004983/137 Cancellation Accepted: Operating between Illfracombe Bus Station and Combe Martin Wildlife & Dinosaur Park given service number 30/30C effective from 23-Sep-2012. PH0004983/347 Cancellation Accepted: Operating between Barnstaple Bus Station and Ilfracombe Bus Station given service number 3 effective from 23-Sep-2012. PH0004983/349 Cancellation Accepted: Operating between Barnstaple and South Molton given service number X7 effective from 23-Sep-2012. PH0004983/198 Cancellation Accepted: Operating between Bude Strand and Holsworthy Church/ Library given service number X9 effective from 23-Sep-2012. PH0004983/348 Cancellation Accepted: Operating between Barnstaple Bus Station and Swimbridge given service number 5 effective from 23-Sep-2012. So we now know its the 23 September when First Devon & Cornwall pull out of North Devon with Stagecoach taking over on the 24th. The competition between Stagecoach and Western Greyhound over the X9 / 599 is interesting in that Western Greyhound start their additional services a week earlier! This could be one to watch! If the planned sale had been allowed to go through then this bus would probably have joined Stagecoach. It will be interesting to see where it ends up after its services are no longer required in North Devon. Will Devon & Cornwall be able to keep them local or will they end up being moved elsewhere within the First Group empire? There are plenty of routes locally which could do with decent buses like this. 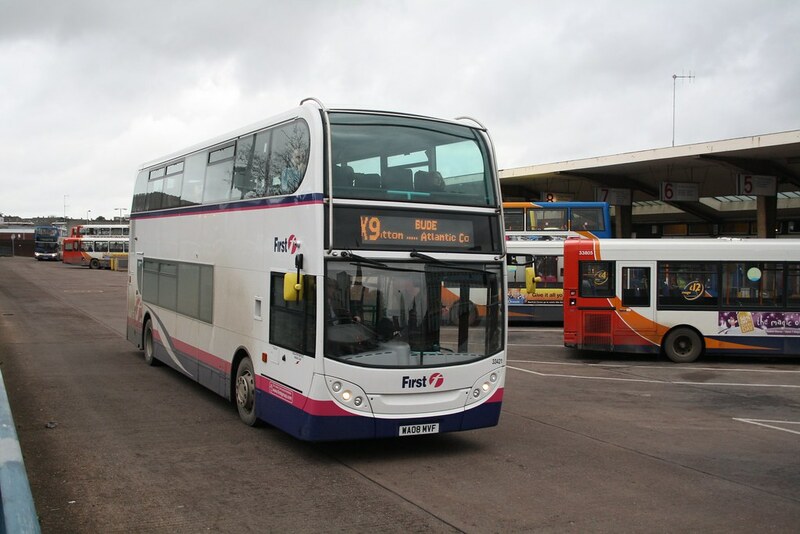 The Plymouth – Tavistock coridor or the Plymouth – Torbay route are crying out for decent buses. It does rather illustrate the difference between how First Group and Stagecoach have run their businesses over the years. A nice new bus like the one above is a real treat for First passengers, whereas for many Stagecoach passengers , new double deckers are the norm.